You know there are days when you just do NOT feel like doing anything at all? When you’re too stressed out, lethargic, and absolutely abhor the sight/sounds of pests circling around you, the blank screen of the computer staring at your face, and writer’s block on a most discouraging strike? Yeah, I’m having one of those days. And this has been dragging on for far too long. So pardon the lack of posts, and almost all of them being lack-lustre and devoid of life, wit, or sarcasm. The festive season came and gone (at the halfway mark now, but yet to really, really relish in the joy and camaraderie …) without much fanfare, for misfortunes rained down on the family, pelting us incessantly. Life is tough. So what better way to overcome the blues than to indulge oneself in some delicious, cheap yet satisfying (AND Halal to boot!) 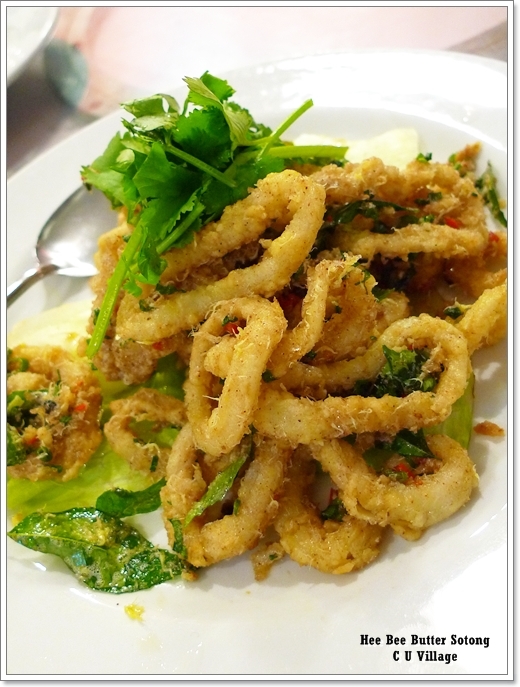 Nyonya cuisine, right in the heart of the city. 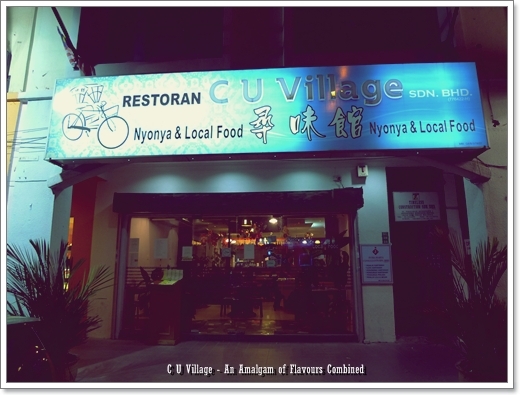 In Greentown Business Centre, seated somewhat strategically amongst a row of restaurants, Astro service centre, bakery (Gold Vision), etc, is this restaurant simply named C U Village, which has been catering to the lunch crowd for years now, with valued individual meals from RM5 onwards. And makes you wonder why the MONGOLIAN moniker, when I doubt the creamy, peppery gravy originates from the country with yaks, warriors and such. Aside from serving rice with dishes, and a rather enviable array at that, you can also opt for the individual meals ranging from their famous Village Nasi Lemak, Nasi Goreng and Nasi Tomato to Rendang Chicken, Sambal Petai (YAY!) with Sotong, and even noodles such as Singapore Fried Beehoon (don’t ask, for I highly doubt this hawker fare originates from the country down south either), and even porridge. Talk about variety! And all of those are priced at BELOW RM10 each, with ample servings, and side dishes such as acar, crackers (papadom, last I remembered), beancurd/fish cake, etc. But of course, this time around, we were somewhat coerced to order the Chinese New Year sets (yes, for a limited time only, starting from RM42.80/USD12 onwards, for a family of 3-4) and we did not regret that decision either. For that price, you get white rice, and Chinese tea served with the dishes (4 in all). They can really whip up a mean Mongolian Chicken dish, at the right level of creaminess and slightly punctuated with the addition of piquant black pepper to spice up the dish. 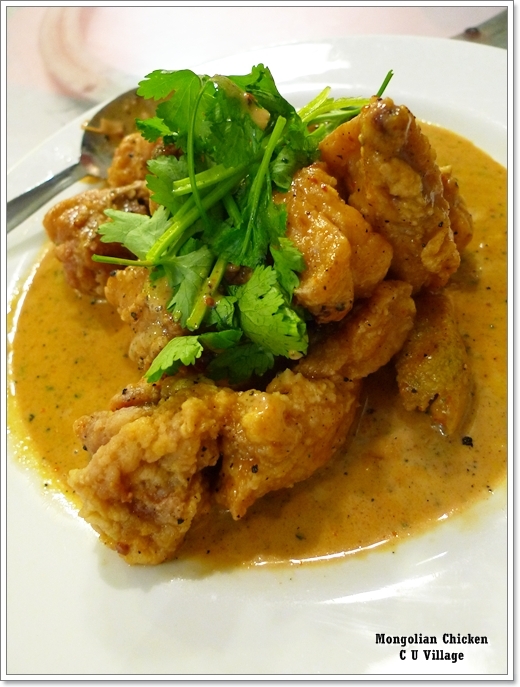 The boneless cuts of chicken were deep-fried prior to being cooked with the sauce. No complaints, and while we’re at it, C U Village also serves a rather mean Rendang Chicken (or Mutton) as well. The Fish Fillets with Sesame was slightly disappointing, being neither here nor there in terms of presentation and flavours. Resembling the average sweet and sour variety, you’d be better off asking for the fish to be served in Nyonya Assam gravy instead. Crunchy Kai Lan stir-fried with dried chillies and minced chicken was next, capturing the sweetness of the kai lan without compromising on the potential bitterness of the greens. The minced chicken made poor replacement for my favourite Siew Yoke (roast pork), but of course, this being a HALAL restaurant, that’s understandable. 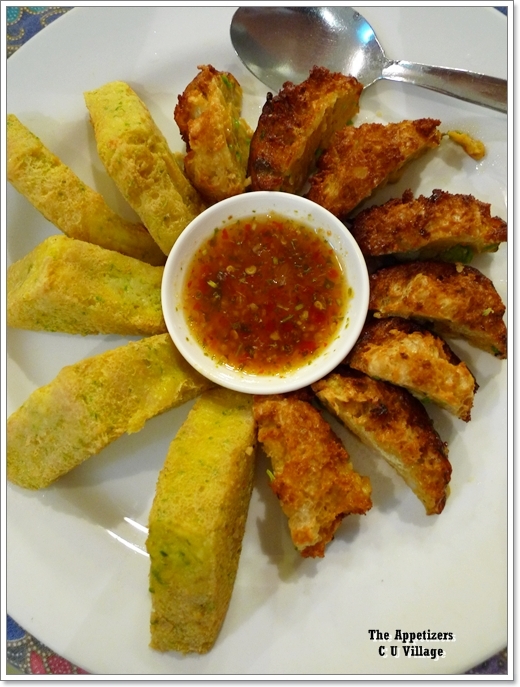 The platter of fried beancurds and crunchy rolls were served after the aforementioned dishes, somewhat awkward for the platter resembled appetizers more than mains. But still, decent enough, and served with the predictable Thai chili sauce as dipping. We ordered an extra serving of Hee Bee Butter Sotong (RM12.90/USD3.70), which is batter-fried squid rings in a milky base with egg shreds, curry leaves, and dried shrimps. Not that spicy, so this should be a hit with the children as well as the adults. Some of the common Individual Meals served for lunch and dinner at C U Village. And that unforgettable Ais Sirap Bandung. Trust me, it’s the BEST in town. I love the Sirap Bandung (rose syrup with milk) served at C U Village, and have always been ordering the same beverage all this while. Yeah, every single time. Though some might argue that you can find Sirap Bandung at every single mamak stall, kopitiam, and Malay eateries, I cannot deny the fact that C U Village mix an almost ideal proportion of evaporated milk, and the pink syrup. This can’t be found in the menu, and very, VERY seldom you see people ordering this. Hence do ask the staff to consult with the boss(es) if they’re scratching their heads wondering what in the world is a Sirap Bandung?!! Business hours : 11.00am until 10.30pm. Here’s a GOOGLE MAP to C U VILLAGE. They provide catering services as well. 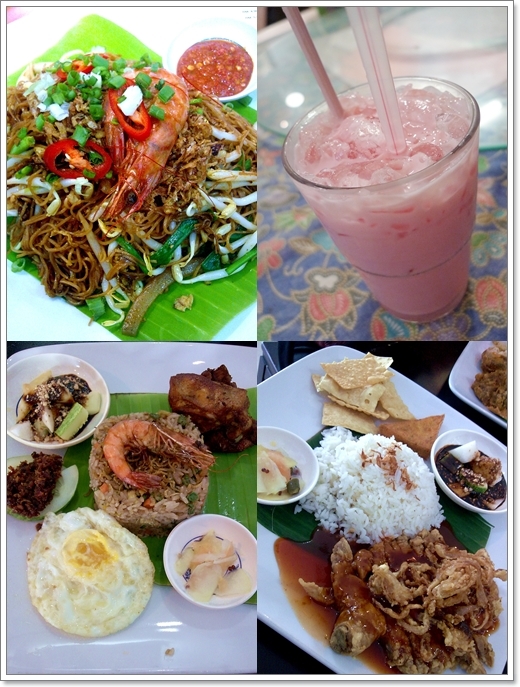 Delicious Halal Nyonya food at reasonable prices, in Greentown Business Centre of Ipoh…. There was a time when the quality of the food dropped n v din go for some time. Bt lately the food has been steadily excelling in our books. Very reasonable price to me. Good find! It’s nice to see Ipoh finally getting so many new restaurants around. It’s about time I say. I think I like the food here judging from the pictures. Cheer up & be happy my friend…. Bee gaik, yum yum n Assam house also serve more or less the same fares. C U Village actually originated from a corner ‘dai chow’ restaurant somewhere in Ipoh Garden East. Now renamed to SP or something. Been a fan of their Or Chien since then, but I don’t see it in the menu of C U Village. Below RM10? That’s incredible! And so much variety too.. A gem! 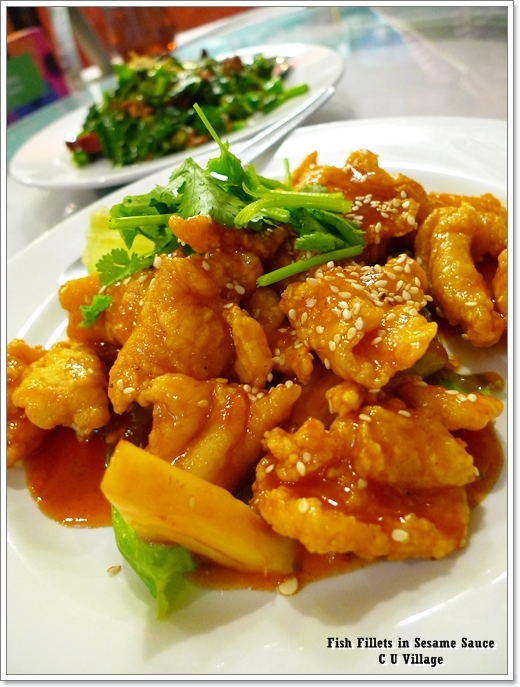 the mongolian chicken sure looks good… I never eaten butter fried sotong before… but sure looks tempting yummy. Yeah. Maybe born n bred there. 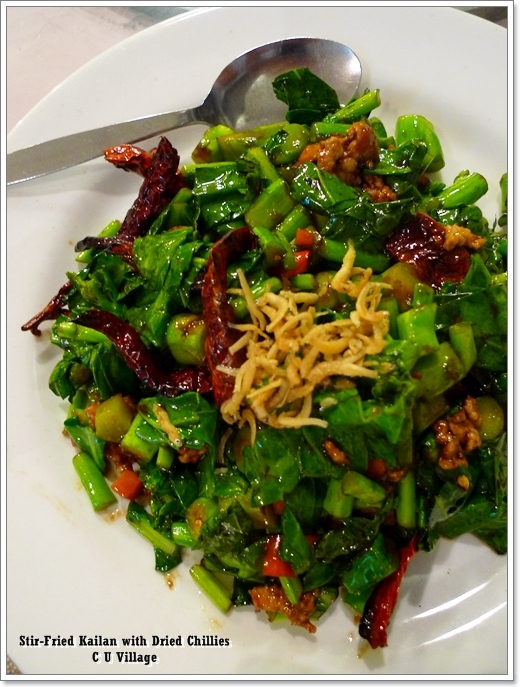 Or maybe the sinful,peppery sensation befits the colder climate there? Trust me it’s good. And I’m not even a fan of air Bandung. Brought my fellow office mates frm Penang to dine at Yum-Yum Restaurant. They came out very happy with the meal..but all 4 of them commented that it serve nothing Nyonya. Where is the jui-hu, where the otak-otak etc. 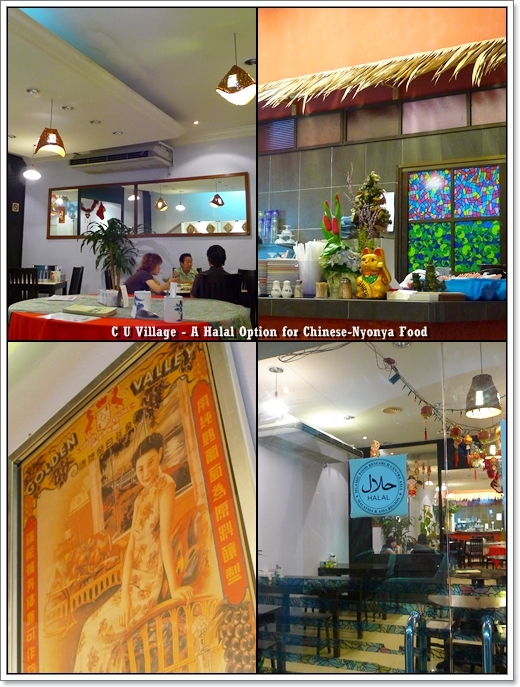 Come to think of it the food serve in Yum-Yum or Assam hse etc is not actually Nyonya as claimed. Wahhh… i do miss all these fare! really i do! where is this c u village?i couldn’t find it after searching for few rounds.in the end ended up at assam house. Hi LiLian. Don’t tell me the restaurant is closed?! It’s right between Momo Cafe in Greentown, and Astro service centre. Not the Assam House side, but the other side with Maybank at the corner. ya found astro, persandungan (mamak) but cant find C U Village. i check the address, is it previously known as Filling Station? but i see your pic of the shop it doesnt look like a corner lot. i called the phone stated but nobody answer although there’s ringing tone. what do u think? isnt momo cafe at medan bistari, same row with michaelangelo’s / fu tien? or maybe i remembered it wrongly. can anyone verify whether this C U Village is still doing business? i’m curious as to why i couldn’t find it. maybe i went to the wrong area or is it really closed down. It is closed, heard the owner migrated to Australia. Food was really good and really cheap. thanks syl for the clarification. too bad i couldn’t taste the food before it was closed down. anyway, there are still loads of food to be tasted around ipoh, and everywhere in the world. Thanks Syl. Sorry LiLian, that you discovered about C U Village rather late. True, I doubt you can find durian cendol in Ipoh now. Maybe you can try Simpang Tiga, Yum Yum, or Assam House?